Ramen Tatsu is a shop that had been on my list for a while. At the end of 2012 it sprung up as another fish-based ramen shop, and it looked interesting. I even headed over to Uehonmachi to pay it a visit, only to find it was closed for no reason. But here I am, back again in Uehonmachi, and it's time to finally try it. They offered the Tatsu ramen and the "Goku", super, Tatsu ramen. I went with the Goku. What an interesting bowl. The broth was clear, which normally makes me think of a light, shio ramen, but it was instead a thick, gyokai tonkotsu soup. It was a really good balance of meaty and fishy; similar to some of my favorite places, but leaning more towards the fish end. The noodles were thin and soft; they stuck together, making them easy to eat in clumps. The chashu was barbecued right in front of me with a blowtorch, and tasted as good as it looked. Yeah, this place was great. Yes, Tatsu helps round out a weirdly delicious Uehonmachi. New location alert! Not just any new shop, but a new branch of Showacho's famous Saisai. And right in Namba, too. Too good of an opportunity, I checked it out just over a week after it opened. Torn between the shio and shoyu ramen, in standard or white chicken "paichin" form, I followed the advice of the employee and went with the paichin shio ramen. When I talk about a bowl of shio ramen, this is not what I think of. The broth was cloudy, meaty, giving a rich unfiltered taste of chicken. The noodles were medium, round and firm. On top was some extra crunchy menma, and fatty chashu. A heavy bowl that weighed me down in the end - not what I would think from a normal shio. It was good, but next time I'd try one of the other combinations. Saisai is in a southern part of Namba without much competition. Which makes Saisai the best in that area. For a food blogger, there are few things that can cause a major crisis. Restaurant you were expecting to go to closed? I've been there. Favorite restaurant shut down? Par for the course. Confused about what to get? That's what life is all about. The one thing I cannot get past is my camera running out of batteries just as I approach a shop. It was dinner and I was hungry, and though I seriously considered turning around and heading home, I forced myself to enter the shop and use my low resolution phone camera. I'm not even talking about a nice iPhone or Android camera; this was the camera on a phone most people stopped using five years ago, at latest. I considered going back again to Gekko Kamen to eat another bowl and take a better photo, but alas, as you'll learn later, the ramen was just not good enough. So enjoy an Osakan's take on Onomichi ramen, in low, low definition. The broth was shoyu, with tons of globules of pork fat, similar to the Onomichi ramen I had in its hometown. 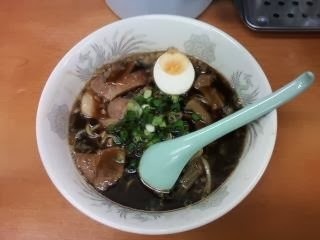 However, unlike those shops, this ramen wasn't sweet, but was dark and very salty. The noodles were long and flat; they weren't great but helped cut the salt from the soup a bit. The chashu proved the best part; juicy and fatty. I still have too fond memories of the real Onomichi ramen to try this again. Recently, a couple of chefs from Osaka sardine ramen chain Tamagoro opened up shops in the illustrious if slightly hidden Osaka Ekimae buildings. I reviewed one of them, Rokubei not long ago, and finally I had a chance to go to its cousin Uonosuke. Not straying too far away from its ancestor Tamagoro, Uonusuke's recommended ramen is the super sardine ramen, which is what I ordered. Just like Rokubei laid on the bonito heavily, Uonusuke was all about the sardine. The broth was clear and drinkable, and the fish taste was strong. The noodles were curly and uneven, like handmade ones, and were of the right quality to match the soup. Even the toppings, which included a large slice of chashu, super-thick menma, and a wonton skin had the powerful taste of sardines to them. Maybe, it was pretty good. If you're a fan of fishy ramen, this is your place. A chance to return home! I love Japan, and I'm not unhappy to be here after this long, but I do like visiting home too. Whenever I go on a long flight, I make sure to fill myself up before hand, because there's nothing worse than being starving on an airplane. Luckily for me, Kansai Airport has a branch of Osaka shio ramen chain Ryukishin. I've visited various branches of Ryukishin before, and they were pretty good, so I decided to try their airport shop. The broth was a solid, light, salty shio. The flavor was made more interesting by the pile of onions that was added to it. The noodles were thin and went down easy. A light and refreshing bowl; perhaps not to the standards of the other branches I've been to, but good enough to hold me over and not give me a stomachache on a long flight. I'd consider stopping by next time I'm hungry on my way out of town. If you're in the airport, it's a good option. When looking online for a good shop to go to, I stumbled upon Miyazaki Kyodo Ryori Dogyan. Some places listed it as a ramen shop, some as an izakaya, but all praised its ramen. So I went to have a look. It turned out to be more of an izakaya, albeit one that serves ramen, similar to the other shop I went to recently, Danieru no Baai. I didn't bring any friends this time, so I ordered only their specialty ramen, Takaida-kei chuka soba. Of course, as a table charge, I received a small dish of horumon, or various innards. As expected of Takaida-kei shoyu ramen, the broth was dark, and deep. Thankfully, though, it was less salty than other incarnations, which meant I could easily drink it all. The noodles, too, were pretty good; thick, and firm. There was one giant piece of chashu, but it didn't stand out much. Yeah, I'd like to try some of their other food, too. It's a good place to go with friends in Honmachi. I was hungry and looking for ramen shops in the Namba area I haven't been to. I eat in Namba often, so I have a pretty good handle on what shops are around, but every once in a while I notice one that has somehow slipped under my radar. This time, it was Tokio Sazae, a spicy lobster miso ramen shop located right in the middle of Nipponbashi's otaku paradise, Denden Town. How I missed such a place is beyond me, but I was pretty excited to check it out. Tokio Sazae's main dish is the lobster ramen. Although it's ramen, it comes with some spicy sauce on top and on the side, meant to be mixed in like abura soba. Also a side of a bread, because, why not? Furthermore likening the ramen to abura soba, the broth was more like a sauce than a soup. It had a strong lobster taste, backed up by miso. It was pretty good on its own, but it became more and more spicy and delicious as I mixed in more sauce. The noodles were fat; good for a saucy broth like this one. The bread was a strange addition, but it went well with the rich flavors of the lobster concoction. Spicy, weird, and delicious. I would have, but it's closed at time of writing. If it was still open. I was walking home one day and decided to swing by a beer bar I like, Dig Beer Bar. As I was walking, though, I noticed an interesting looking ramen shop. Without taking too much time to think about it, in I went. They offered a variety of gyokai shoyu and shio bowls; I went with the gyokai shio. Like any good shio, the ramen was light and easy to drink, but this one was very fishy with a bit of onion flavoring the soup too. The thin, yellow noodles, too, tasted very fishy after being soaked in the broth. The bowl was rounded out by a strange shark-tooth looking piece of menma, and a couple juicy slices of chashu. Yeah, it was good and I'd like to try some of the other menu items. It's a great place if you're in the Higobashi area.